Unfortunately, Windows 8 tablets and an alarmingly large number of ultrabooks don’t come with Ethernet ports, depriving them from the advantages wired connections can offer at times of emergency. One of these advantages is Gigabit mode, which allows the transfer of large files at rates rocketing up to 1000 MB/s. 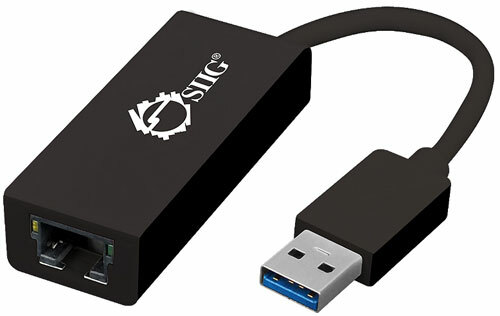 Fortunately, SIIG will be releasing its USB 3.0 Gigabit Ethernet Adapter, allowing reliable, wired connection speeds to tablets and ultrabooks. Sharing large files over the Internet sometimes doesn’t cut it when it comes to time. Additionally, users can’t sometimes avoid facing problems with inconsistent wireless connections or connection speeds and, thus, have to resort to wired connections. Wired networks provide a certain reliability that wireless ones can’t compare to. The SIIG USB 3.0 Gigabit Ethernet Adapter is a dongle device and adapter that is compatible with Windows and Mac systems. Being an adapter, its job is fairly simple; a USB port will temporarily become an Ethernet port. Through this, the SIIG product allows users to share large files over a wired network or connect to the internet through an Ethernet cable. The unit can consume up to 900 milliamperes in terms of power, but whether that needs to be reached to turn on Gigabit mode is up in the air. It also fully adheres to the specifications set for USB 3.0. As additional features, the SIIG USB 3.0 Ethernet Adapter has Wake-on-LAN, a power saving mode (when not plugged into a port), and diagnostic LEDs that signal to users when the adapter is working. Overall, it’s a well thought-out device for something that comes in such a tiny package. SIIG’s USB 3.0 Gigabit Ethernet Adapter retails for $49.99, but it can be found at prices as low as $33. The unit comes with a five-year warranty for insurance. Purchase of SIIG’s product will yield the Ethernet adapter itself, a driver CD, and a user’s manual. If you have an ultrabook or tablet and see the possibility of encountering absolutely no wireless connection in travels or business-related circumstances, then it may be wise to invest in this USB to Ethernet adapter. This entry was posted in SIIG and tagged Gigabit Ethernet Adapter, SIIG, USB 3.0. Bookmark the permalink.